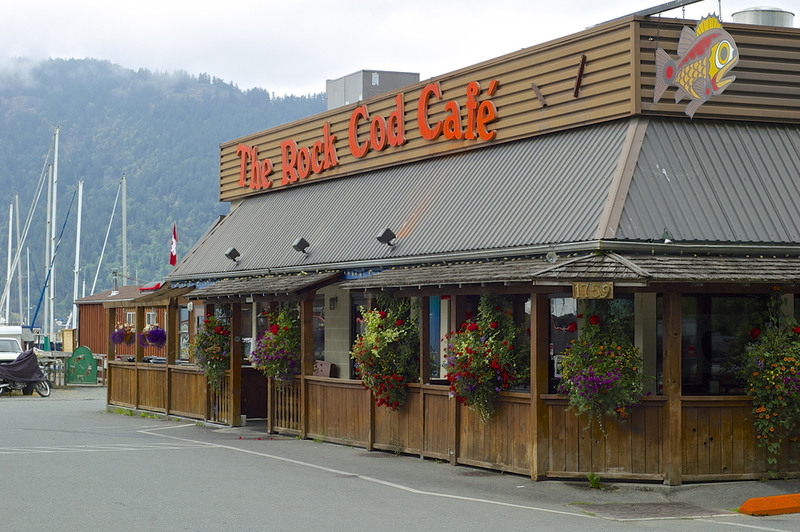 The Rock Cod Cafe is located right in the heart of Cowichan Bay, British Columbia, at 1759 Cowichan Bay Road. Cowichan Bay is about an hour's drive north of Victoria and an hour south of Nanaimo. From United Airline's Hemispheres magazine, August 2013: Jacqueline Detwiler, "Driver Down". Victoria can be reached by air or by ferry. B.C. Ferries from Tsawassen (just south of Vancouver) to Schwartz Bay (just north of Victoria). Washington State Ferries from Anacortes to Sidney. Black Ball Ferries, from Port Angeles to Victoria's inner harbour. Nanaimo can be reached by air (Cassidy Airport), or B.C. Ferries from Horseshoe Bay to Departure Bay, or from Tsawassen to Duke Point, just south of Nanaimo. Exits from the Island Highway are well marked whether approaching from the north or south. Once off the highway visitors have about a ten minute drive through countryside and farm land before reaching the village. Boaters arriving from the United States are required to check in with Canada Customs and Immigration as soon as possible after crossing the International Boundry, generally at Bedwell Harbor, Sidney or Victoria. Float planes can be chartered into Cowichan Bay from Vancouver or Seattle, but there are no scheduled flights to the Bay. Fresh seafood, and lots of it! One meal & you'll be hooked for life. Featuring fresh seafood, famous fish & chips, fish tacos, & a host of other good fare to fill you up and have you coming back for more. Featured on the Food Network show "You Gotta Eat Here" & passionately committed to sustainability through partnership with the Ocean Wise stewardship program. We are 99% Ocean Wise. Only one item is not on the list, but it is Marine Stewardship Council certified. We are passionately committed to sustainability!